In a world where Google is the new Yellow Pages and local search is growing by leaps and bounds, getting positive customer reviews is vital. Reviews influence purchase decisions and play a role in local SEO ranking — the Google 3-pack, for example. With that in mind, here are seven ways to get more customer reviews. Claiming and verifying your business listing in local directories and review sites such asGoogle My Business, Yelp, and Angie’s List is an essential first step. Sites like these are where consumers who conduct local searches are likely to find you. They also serve as another channel in which to publicize your business (often at no cost), ensure the accuracy of your NAP (business name, address, and phone number), and respond to what reviewers are saying, both good and bad. There are dozens of directories and review sites. You don’t need to be on everyone, just those where it makes sense based on your location and industry. For instance, hotels should claim their listing on TripAdvisor while restaurants will want to be present onUrbanSpoon. Contractors and those in the home services trade might opt for sites like Handy, Thumbtack, and Angie’s List. Healthcare professionals should claim their listing in Healthgrades and ZocDoc. A good way to determine the best directories for your business is to conduct a Google search using relevant keywords that include your industry category. Localize the search by adding your city and state. Also, search for your competitor’s brand names. Most likely, you will want to claim listings on sites where they appear. As an example, a search for “appliance repair Phoenix AZ” showed returns from Yelp, Thumbtack, and Angie’s List. Directory results for appliance repair in Phoenix. Another search, for “pediatricians Atlanta GA,” returned listings from Yelp and Healthgrades. Results for Atlanta pediatricians include Yelp and Healthgrades. Some directories — Google My Business and Yelp, for example — get more traffic than others, so it’s imperative that you list your business there. Directories like Insider Pages and Citysearch “seed” content to other sites, so consider claiming your listing on those as well. Once you’ve claimed your listing, it’s time to “put out your shingle” and promote the fact that you want customers to write reviews. Notice that I said “promote,” not “ask.” Some review sites, particularly Yelp, are very restrictive when it comes to how you can seek out reviews. Others, like Google My Business, encourage asking for reviews. Here are some key ways to get reviews that shouldn’t offend any site’s policies. Create print materials such as business cards or flyers that list the places where customers can leave a review. Give them to customers at the time of service or, in the case of retail, following a product purchase. Place links to your directory and review site profiles on each page of your website, perhaps in the footer, and add them to your email signature. Affix review site signs and stickers to the door or front window of your place of business. Also, put a placard on the counter, where customers can see it when they check out. Yelp sticker on a retail store window. Train staff members to request a review, but only for sites where it’s okay to ask. After completing a service, follow up with an email containing links to places a customer can review your business. Seek reviews from various sites, as diversity will help your local search ranking. Google might construe that reviews coming from a single site is an effort to manipulate search rankings, which could result in a penalty. Once you’ve acquired some customer reviews, promote them on your website and in social media. If you get a particularly meaningful review, contact the customer to obtain the full story and turn it into a blog post or video testimonial. Also, add reviews to your business’s print promotional materials. Customer review posted to pest control company website. The best way to ensure you get positive reviews is to make customers happy with their experience. While 100 percent satisfaction is not a reality, strive to make every interaction remarkable. 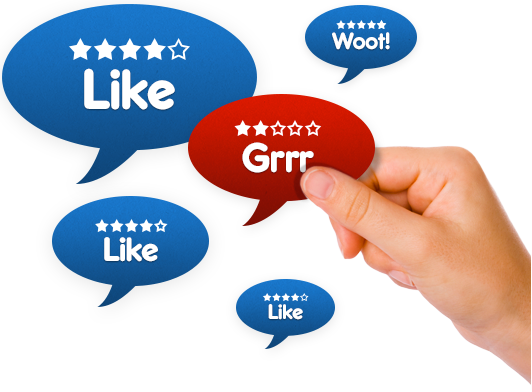 Customers will reward you with affirmative word-of-mouth and, if prompted, a favorable review. Make it a practice to respond to every review, whether positive or negative, and do so promptly (within 24 hours if possible). An active presence on review sites shows you care and could result in turning a dissatisfied customer into one who gives you a second chance. Don’t ask customers to submit reviews all at once, as Google might flag the activity as suspicious. It’s better to get reviews in a natural progression over time. Make gathering online reviews a regular part of your business processes. Software platforms such as Get Five Stars, Yotpo, and Power Reviews make the job of getting customer reviews easier. These are premium services that require a monthly subscription, but are well-worth checking out. GetFiveStars is a platform designed to get customer reviews.